Coming from Ireland, I never knew that there were different schools of oboe playing - I just played and produced the sound that I heard in my head. In my formative years I had lessons in Ireland from English, Algerian(French) & German players and living in The Netherlands, with its rich wind playing tradition, has of course in the last years also influenced my playing greatly. Because I was allowed to grow organically into playing the oboe in this way, my approach to teaching is very much influenced by this. 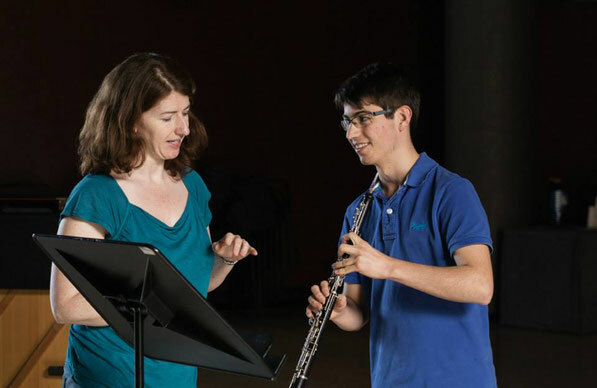 I see every student as an individual with an authentic voice, and my job is to help this voice be heard by giving him or her the necessary musical & technical tools & tips to make playing the oboe easy, hence giving them the freedom to express themselves. Growing up in Ireland with limited access to other oboists made me have to work out how to solve issues myself, and learning from Klaus Becker in Hannover verbalised the method & technique for me. He explained it so well that I now know how to pass this information on, and his strong musical personality taught me so much about phrasing, historical context and finding the character in every piece of music. His orchestral excerpts classes were fantastic(he was Principal Oboe of the Bavarian Radio Symphony Orchestra before becoming Professor), and ensured that the vast majority of his students all ended up with an orchestral job, no mean feat nowadays. My own 20 years experience as a professional orchestral player has also given me a huge amount of information that I am eager to pass on. Klaus' mantra, which we always joked about in class, was "Stützen, locker bleiben, Luft führen"(support, relax, direct the air). It was only until I started doing Alexander Technique(c.10 years after graduating - better late than never!) that I realised what he meant with "Locker bleiben", and that was, "Let go". And it is this letting go, or finding the joy in what you do, that is the root of oboe playing and teaching for me. If it's not fun, then what's the point? That does not mean of course that there's an absence of sweat and tears behind striving for success, the opposite is the case, but investing positive energy and being aware of your body, where the sound begins so that you can eliminate stress and play freely, is important to my approach. For that reason, when necessary, I also incorporate elements of Body Mapping into my teaching so that students are also fully aware of how the body is actually built, and not how they think it is built, so that freedom of movement can be optimised. What I also find important is to know what a student's ambition is for a career in the music industry. We are in a fast-changing world at the moment, and making it in the music profession demands more versatility, flexibility and creativity than ever before. I think it is essential that students are aware of this and are open to embracing the challenges, not only by investing the hours and dedication to achieve as high a standard as they can on the oboe, but also by identifying what and how it is they can contribute to the music world in the most authentic way possible. I teach at the Amsterdam Conservatoire and also privately in central Amsterdam.